“A Beautiful Mind” makes it the Top 10 list of many. The movie is indeed great. 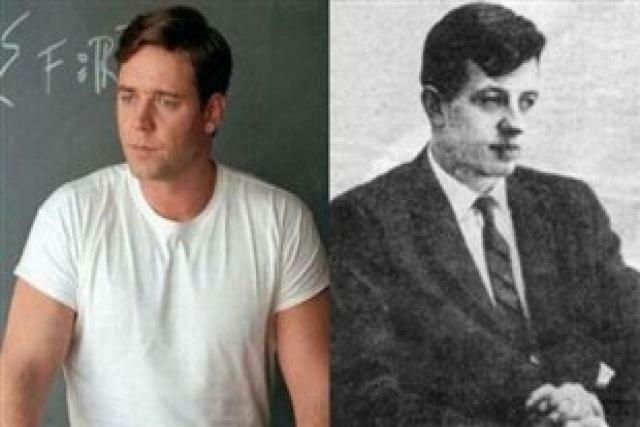 Director Ron Howard did a marvellous job and then the stellar acting by Russell Crowe and Jennifer Connelly based on the life on the noted mathematician John Nash, Jr. (1928- ) who received his PhD from Princeton University in 1950. When speaking about his research, the impact of his 27 page dissertation on the fields of mathematics and economics was tremendous. In 1951 he joined the faculty of the Massachusetts Institute of Technology in Cambridge. His battle with schizophrenia began around 1958, and the struggle with this illness would continue for much of his life. Nash eventually returned to the community of Princeton. He was awarded the Nobel Prize in Economics in 1994. The 2001 film A Beautiful Mind, staring Russell Crowe, was loosely based on the life of Nash. Here are 5 questions and answers that you need to know about the real John Nash vs the one portrayed on the film. 1. How can I obtain a copy of Nash’s dissertation? Nash’s dissertation, Non-cooperative Games, is available on this web site in pdf format. The dissertation is provided for research use only. Non-cooperative Games, dissertation, John Nash, May 1950. 2. In the movie A Beautiful Mind there is a scene in which faculty members present their pens to Nash. What is the origin of the pen ceremony? When did it start? The scene in the movie A Beautiful Mind in which mathematics professors ritualistically present pens to Nash was completely fabricated in Hollywood. No such custom exists. What it symbolizes is that Nash was accepted and recognized in the mathematics community for his accomplishments. While some movies are based on books, the film A Beautiful Mind states that it was inspired by the life of John Nash. There are many discrepancies between the book and the film. 3. May I have a copy of Nash’s 1994 Nobel Prize acceptance speech? “He was not inclined to give speeches, he said, but he had three things to say. First, he hoped that getting the Nobel would improve his credit rating because he really wanted a credit card. Second, he said that one is supposed to say that one is glad he is sharing the prize, but he wished he had won the whole thing because he really needed the money badly. Third, Nash said that he had won for game theory and that he felt that game theory was like string theory, a subject of great intrinsic intellectual interest that the world wishes to imagine can be of some utility. He said it with enough scepticism in his voice to make it funny”. 4. What other things I need to know about John Nash’s life? – John Nash fathered an out-of-wedlock son with a Boston nurse. – He had made numerous anti-Semitic comments during his period of extreme mental illness, most of which linked Jews and world Communism. – Nash had recurring liaisons with other men. – He shared the Nobel Prize with Reinhard Selten and János Harsányi. – Nash blamed Alicia for twice committing him to a mental institution and the couple had divorced in 1962. – More can be read in detail here. 5. Where can I find John Nash’s academic publications and notes? You can access the Princeton University Department of Mathematics to see all John Nash’s publications up to date, just click here. Note: If you want to see how Dr Nash speaks and interacts in real life, please click here to watch an interview by the Nobel Prize Committee to John. Nash also, sadly, denied the paternity of his son for some time before accepting that his wife’s son was his.